February 2015 – Page 2 – ¿Dónde Está el Baño? 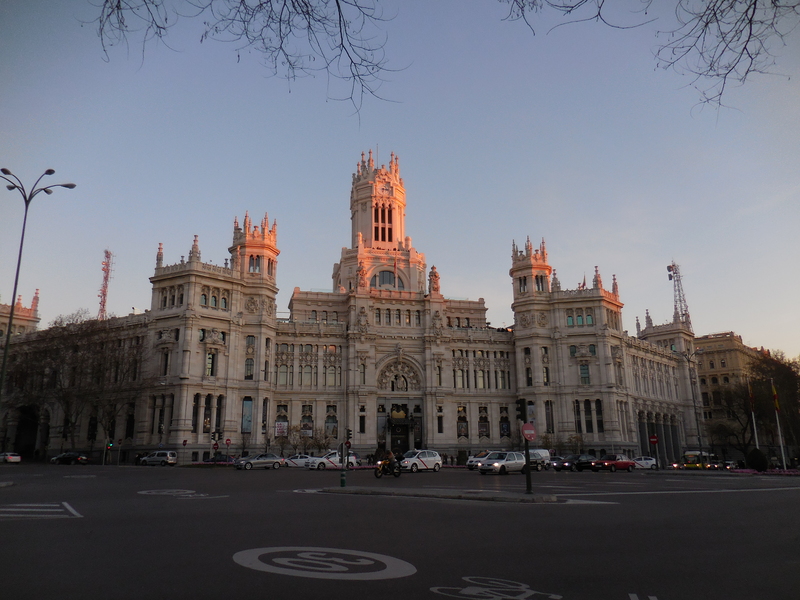 In three weeks, I have grown quite accustomed to Madrid life. I have learned that the vocabulary has notable variations from the Latin-American Spanish that I am more familiar with hearing at home. While I am glad to be in the loop with the authentic Spanish lingo, there has been some disappointment. In fact, there was a realization of disappointment surrounding this very blog. While I thought the title ¿Dónde Está el Baño?, would be just perfect for this trip, it does not resonate nearly as much as I anticipated. It’s not because I’m not asking that question – believe me I am – but it’s because the word baño seems to hardly exist in Spain! Can you believe that?! 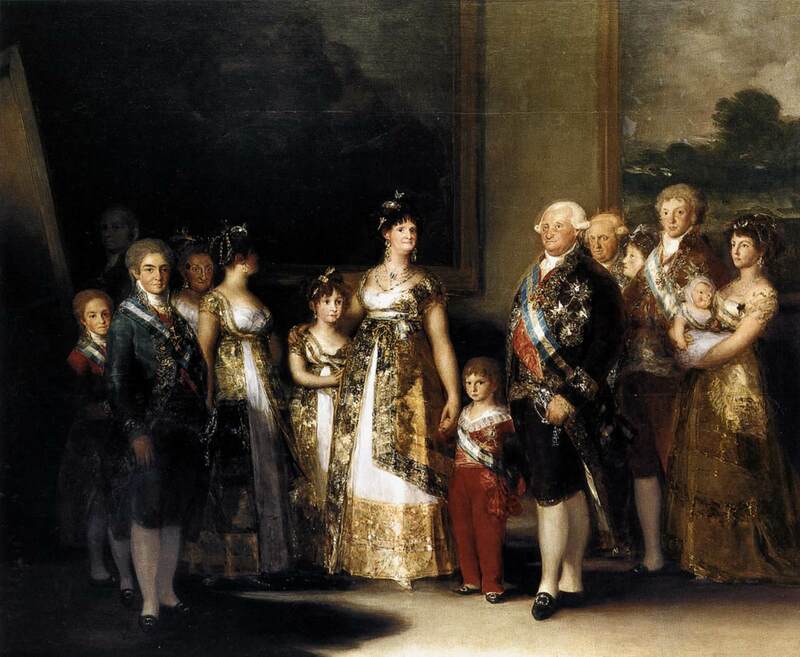 Each time I use a different word than baño, I feel like I’m being disingenuous to my blog, my brand, but I’ll just have to start saying aseo or servicio more often if I hope to become a Madrileña. In any event, this blog’s name is not changing and I hope that despite this now slightly less relevant blog title, you’ll keep reading. First, a little bit of housekeeping. Thank you to everyone who has read my blog so far. Your comments, emails and feedback bring me so much joy. I enjoy writing each post and it’s gratifying to know that people actually read them. So thank you. Gracias. Second, I added a few do-dads to the site! There’s now a photo gallery where I’ll be adding more photos than just the ones in each blog post. Additionally, there’s a list of my upcoming eventos and trips, a place where you can sign up to receive email updates when I publish a new post, and an archive so you can go back and read every single post again if you want! This past week marked my first week of classes. After all, it is study abroad. I’m taking cuatro clases: International Relations – Contemporary European Issues , Political Science – Critical Issues in Comparative Politics, Contemporary Spanish Literature and Introduction to Contemporary Spanish Theater. The beginning of the week began with spectacular weather. I took full advantage of the major sol exposure and spent a delightful afternoon in Retiro – not a nube in el cielo. With my book, snack and sunglasses, I plopped down on a sunny bench. I heard birds chirp and watched people stroll by, ride bikes and walk their dogs. It felt like summer with the sun’s glow warming my skin (granted I was still wearing jeans, boots, a scarf and a sweater, but no jacket!). Maravilloso! Feeling much better, I was back on the calles. 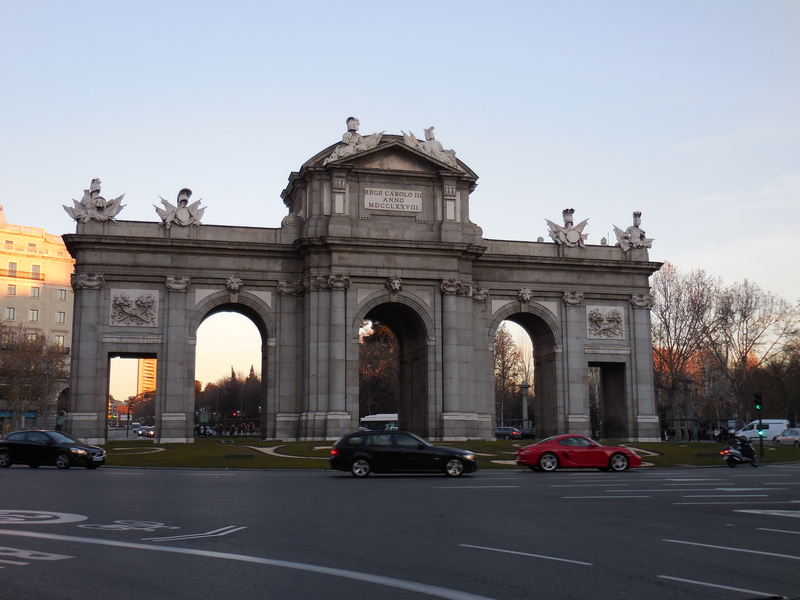 I spent my three-day weekend all over Madrid. My friends Janice, Alden and I planned on doing an architectural walk my guide book suggested, but we got distracted by a massive political protest in Puerta del Sol. Hungry from (standing and watching) the protest, we opted for la comida at Gran Cafe, a restaurant with a warm, vintage pub feel, where we ordered from el menu del día (a set price menu where you pick a first course, second course and dessert – very popular lunch option). My day didn’t stop there. Just as I thought I was going to take a siesta, I instead joined Reed, Emily and Kyron for a café at a super #trendy coffee house. I got a hot chocolate and it was my first-ever beverage with a design in the foam! Just as in America, my Sunday was spent resting and completing mi tarea. The week truly flew by. Whereas my first seven days here seemed to last much longer, falling into a routine of school, homework and continued exploration made this week go by much faster. If the next few weeks pass as quickly as this one, my time here will be over before I know it. The next three weekends I have trips to Granada, Amsterdam and Valencia. There is still so much I want to do in Madrid and throughout Europe, so it’s time to get planning, but I remind myself not to get too far ahead and to enjoy each lucky moment I have here. Walking down the street and seeing this or this. Eating sopa de pescado. Fish soup? Enough said. 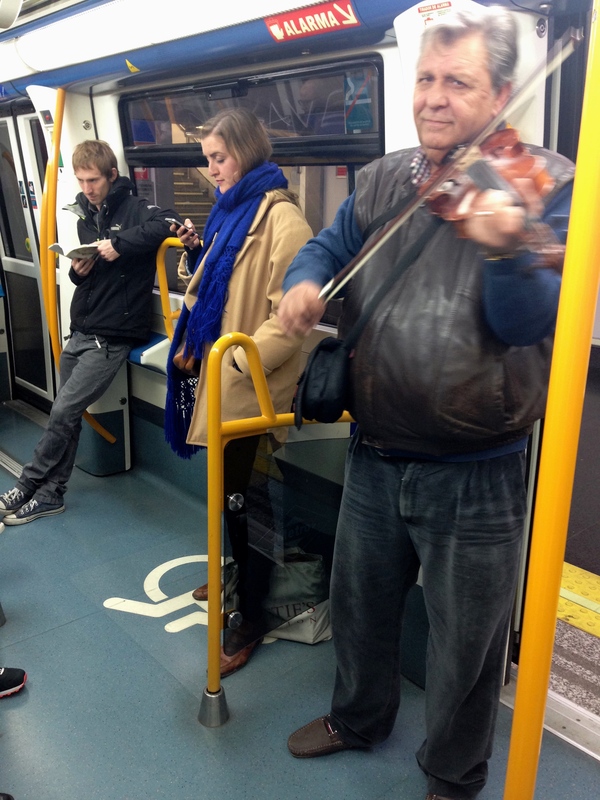 This violinist who plays the same two songs (and not well) on Metro Line 4 all too often. Holding on to the rails and bars in the metro. Each time I think I can balance without holding on to anything. And each time the train starts moving, I clumsily stumble and step on someone’s dedos de pie. Take the autobús. The metro is so convenient, but I want to be above ground and see Madrid, not just dark tunnels. Visit more museums. With my student ID, my admission into museums is free. Viva el arte!